Is íontach an áit an idirlíon – agus is íontach an méid eolais a chuirtear ar fáil ann. An deacracht atá againn, scagadh a dhéanamh ar an eolas agus an méid atá fiúntach a aimsiú. Ach tar éis dom bheith ag caint roimhe seo ar an mbealach chun teacht slán ó na buillí troma atá tite ar na meáin Ghaeilge le tamall gairid anuas, tháinig mé ar an alt seo i Guardian na Breataine. Tuairisc a bhí ann ar chaint a thug Chris Anderson, eagarthóir an iris chlóite faoi chúrsaí idirlín, Wired. Iris é seo atá aitheanta as ucht feabhas an léargais ar an dtreo atá cultúr ag iompú. Ar aon nós, séard a mholann sé go n-aimseodh nuachtáín ‘peataí’ mar a thugann sé orthu a ghineoidh ioncaim dóibh agus iad ag cur nuacht ar fáil saor in aisce ar an idirlíon. When he talks about pets for penguins, he is referring to the Disney’s online game Club Penguin. This is free to play, but they have premium memberships that provide players with additional features. Based on the ideas of his new book Free, he says that newspapers must decide what they provide for free and what premium content and services that they can develop to make money. Anois go bhfuilimíd saor ó lámh marbh an Fhorais, tá sé in am dúinn athmhachnamh a dhéanamh ar an slí chun tosaigh. Tá An Druma Mór ag déanamh na h-oibre seo theana – tá siad ag tabhairt uathu an nuacht saor in aisce agus ag cur ar fáil ar an suíomh – ach anuas ar sin tá siad ag cur ar fáil nuachtán ar líne PDF ó chúl seomra sa Chultúrlann. Ní le drochmheas a deirim sin – ach le mór mheas. Níl gá le ceanncheathrú ollmhór nó eile, níl gá ach le riomhaire agus ceangal idirlín agus an léargas is an cruthaitheacht chun rud éigean atá ag teastáil ó dhaoine a aithint agus a chur ar fáil. Dá leanfaidis múnla Anderson, seans go mbeadh siad ag gearradh taille as an leagan PDF a íoslódáíl. Níl a fhios agam an bhfuil seo eacnamúil – ach is cuimhin liom go raibh Foinse á dhéanamh agus fiú gur dheineas iarracht sintiús a ghlacadh uaidh, nior eirigh liom mar go raibh deacrachtaí teicniúla leis. As newspapers debate their future, the argument has been pitched as free versus paid models, but Anderson argues that the real decision is free versus “freemium”. It’s not about whether to charge but choosing carefully which specialised content people will pay for and developing additional premium services. Of course, many newspapers look to the Wall Street Journal’s model. The Journal offers most of their popular content and many exclusives for free, but they keep their specialised, niche content behind a paywall for subscribers. Referring to his theories behind the long tail, he suggested that newspapers should give away the “head and charge for the tail”. The head of the tail refers to the general interest, high traffic content, while the tail is specialised, special interest content. D’fhéadfaí an argóint a dhéanamh gur nuachtán é Nuacht 24 a chuireann seirbhis ar leith ar fáil, sa chaoi is go ndeineann an Wall Street Journal. Is amhlaidh go gcuireann an WSJ nuacht faoi chúrsaí ghnó ar fáil agus go n-iarann siad ar léitheoirí ar líne íoc as ar an mbonn gur ionann seo agus faisnéis luachmhar do lucht ghnó agus iad beo sa mhargadh. An oiread leis an WSJ, tá Nuacht 24 ag cur seirbhís ar leith nuachta ar fáil, nuacht trí Ghaeilge, agus tá luach le sin, go h-áirithe acu san atá ag foghlaim na teanga, ní h-amháin in Éirinn ach go h-idirnáisiúnta. Tá sé ráite uair nó trí ag Ferdie Ó Faillí Mac an Fhailigh ó Fhoras na Gaeilge go bhfuil sé i gceist comórtas poiblí nua a fhogairt le h-aghaidh nuachtán seachtainiúil a fhógairt. An bhfuil sé ró dhéanach cur ina luí ar an bhForas nach fiú seo ar chorr ar bith? Gur iarracht is fogra (is airgead) amú é, go h-áirithe mura bhfuil á lorg ach an rud a bhí ann roimhe sin. Is fearr dúinn dearúd a dhéanamh ar an bhForas agus an bealach díchéilleach a chaitheann siad airgead an phobail le fána, gan cúntas a thabhairt ar an gcaiteachas go pras is go poinciúil. Is é an bealach chun tosaigh an t-airgead a chnuasú sinn féin agus tabhairt faoin obair agus más maith le Foras na Gaeilge nó Údarás na Gaeltachta nó cibé áisínteacht a thagann slán ó sceannairt an Bhoird Snip infheistiú ann, deanadh siad sin gan a bheith ag reachtáil ‘comórtais’ poiblí…..
Foilsiú: 30/06/2009 . igaeilge a d’fhoilsigh. Ranganna: An Ghaeilge, Cúrsaí Reatha. Clibeanna: An Druma Mór, Chris Anderson, Foinse, Foras na Gaeilge, Wall Street Journal, Wired. 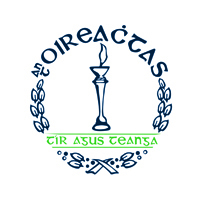 Tá agallamh spéisiúil ag Caitlín Ní Ruanaidh le h-iar eagarthóir an iar nuachtáin, Foinse, ar an Druma Mór ar maidin, agallamh ina léiríonn Seán Tadhg Ó Gairbhí éadóchas go mbeidh Foinse linn arís. Is cinnte gur iriseoir den scoth é Seán Tadhg a rinne sár jab faoi chúinsí deacra. Ní thuigim go raibh na h-acmhainní aige an crut is fearr a chur ar Foinse agus ní thuigim go fóill an scéal seo faoin chúlchiste a bhí ag an nuachtán – ach nár caitheadh, is léir domsa, ar uasghrádú an nuachtáin. Sin argóint do lá eile, áfach. Tuigim cás Sheán Tadhg agus é anois sa tóir ar phost – fiú is go bhfuil taithí na mblianta aige agus iomrá air mar iriseoir, níl na folúntais ann sna meáin faoi láthair, gan trácht ar na meáin Ghaeilge. B’olc an scéal dá gcaillfí a leitheid de thalainn ó na meáin Ghaeilge. San agallamh seo, tá sé ag seachaint na ceiste faoin locht, cé air a cheart an locht a chur as ucht an gcliseadh ar Foinse? Nílim chomh carthannach céanna. Tá an locht ar an bhForas, tá an locht ar Ghaeil nár cheannaigh é agus tá an locht ar an Aire Éamon Ó Cuív a shuigh ar a lámha nuair a bhí an nuachtán i bpriacal an oiread gur shuigh sé ar a lámha nuair a bhí Lá Nua i mbaol. Foilsiú: 30/06/2009 . igaeilge a d’fhoilsigh. Ranganna: An Ghaeilge, Cúrsaí Reatha, Nuacht. Clibeanna: An Druma Mór, Foinse, Foras na Gaeilge, Pádraig Ó Céidigh, Seán Tadhg Ó Gairbhí.